Ependymomas are rare type of tumors or gliomas that develop from ependymal cells that line the ventricles as well as from central canal of spinal cord. They can develop in the spine and also in the intracranial areas. In children, these gliomas generally develop in the cerebellum. Intracranial ependymomas commonly develop in the fourth ventricle. In some rare cases, they can also occur in pelvic cavity. Ependymomas comprise of nearly 5 to 10% of all pediatric brain tumors and they are known to affect both boys and girls equally. The average age of patients during the time of diagnosis is around 5 years. Around 25 to 40% sufferers are below 2 years of age. Pediatric cases mostly occur in the fourth ventricle around the posterior fossa. Ependymoma accounts for almost 25% of all cases of spinal cord tumors. It also constitutes nearly 5% of all adult intracranial gliomas. Nearly 85% of all ependymoma cases are of benign myxopapillary ependymomas. The condition is sometimes associated with syringomyelia and neurofibromatosis type II. The exact factors that lead to the development of these tumors are unknown at the present moment. Research is currently being conducted to determine the possible causes of ependymoma tumors. Grading of the ependymoma tumors is done by observing their appearance under a microscope. This can help to understand the rate of their progression. The tumors have been graded into 3 types. The Grade 1 tumors are generally slow-developing, whereas the Grade 3 ones grow more rapidly. It includes Myxopapillary ependymoma, Sub-ependymoma and Sub-ependymal giant cell astrocytoma. 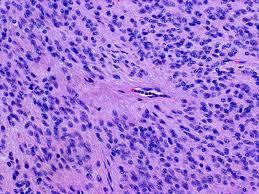 It includes Malignant or anaplastic ependymoma and Ependymoblastoma. These lumps are characterized by the growth of cells having regular round to oval-shaped nuclei. A fibrillary background with variable density can be seen. The tumor cells may develop gland-like elongated or round structures that look like embryologic ependymal canal having long, delicate processes that extend into the lumen. The perivascular pseudorosettes that occur frequently have the tumor cells arranged around the vessels having an intervening zone that consists of thin ependymal processes that are directed toward the walls of the vessel. The ependymomas might have originated from the radial glia. Surgery is the most common form of treatment for this disorder, and is generally performed first to get rid of tumor as much as possible. The procedure is supervised by a neurosurgeon. Although complete removal of the tumor is the prime goal of the surgery, the tumor’s location or other features may sometimes make it difficult for the medical team to remove it completely. 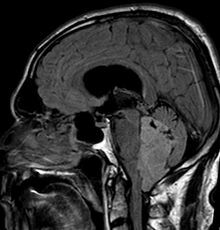 If a tumor leads to the blockage of the cerebrospinal fluid (CSF) flow, a team of surgeons might opt for either of the two procedures to relieve signs of hydrocephalus, or build-up of fluid within the skull. A tube known as Ventriculo-peritoneal shunt (VP shunt) might be used to drain excess cerebrospinal fluid into the patient’s abdomen. Alternatively, the same might be achieved by endoscopic third ventriculostomy. In this process, the neurosurgeons create a tiny hole or an incision that allows the fluid to move past the blockage and flow into the patient’s spinal column. Almost 90% cases of pediatric ependymoma are treated in this method. Precise doses of radiation therapy are targeted to kill the cancer cells that are left behind even after surgical treatment. Radiation therapy is used to check the local metastasis of the tumor. Spreading of an Ependymoma might make it necessary for a doctor to recommend radiation for the whole brain and the spinal cord. Chemotherapy effectively reduces the potential of cancer cells to spread or reproduce. Chemotherapeutic procedures prior to surgery might help to minimize the size of the tumor thereby facilitating its surgical removal. Chemotherapy drugs may be administered orally, intramuscularly, intravenously or intrathecally. Medications might be recommended for controlling of seizures. The outcome of the condition depends on the extent of the tumor resection as well as the age of patients. In some cases, however, the location of the tumor as well as its microscopic characteristics might also influence the overall outcome of the condition. Prognosis is good with total resection of the tumor. Instances of recurrences have been recorded in cases where total resection was not possible. A residual tumor is also most likely to spread through cerebrospinal fluid, which might lead to tumor-related complications. Patients younger than 4 years of age generally have a poorer outcome due to increased incidence of lateral posterior fossa tumor growth. The 5-year rate of survival for adult ependymoma patients is around 50% to 55%. Survival rate for children with posterior fossa tumors is significantly less. Ependymomas are ependyma-related tumors that develop in the spinal cord or cranium. They can cause pressure within the cranium which can cause several complicated symptoms. Treatment needs to be followed up by regular medical checkups for several years to check for any signs of tumor recurrence.